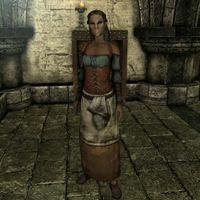 Brelas is a Bosmer pawnbroker met during Elenwen's party at the Thalmor Embassy during Diplomatic Immunity. If you use Erikur as a distraction option, he will attempt to seduce Brelas. Upon her rejection of his advances, he becomes angry and has her sent to the dungeons where Etienne Rarnis is also being held. You will have the option to free her. After you rescue her, she will travel to Windhelm and, if she survived the journey, will spend her time at the New Gnisis Cornerclub with Malborn, assuming he also survived the journey. She will eventually follow Malborn when he flees to Morrowind. When Brelas arrives in Windhelm after being rescued, she may run over to the left of Candlehearth Hall and vanish, rather than going to the New Gnisis Corner Club. This page was last modified on 2 December 2014, at 02:43.